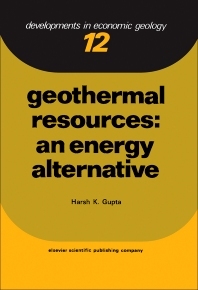 Developments in Economic Geology, 12: Geothermal Resources: An Energy Alternative focuses on the consideration of geothermal resources as alternative energy sources. The publication first elaborates on the energy outlook, basic concepts, and heat transfer. Discussions focus on temperature, heat, and its storage, heat conduction, radiation, and convection, temperatures within the earth and heat flow, volcanoes and plate tectonics, geothermal resource assessment for the U.S., and recoverability from U.S. geothermal resources. The text then ponders on geothermal systems and resources, exploration techniques, and assessment and exploitation. Concerns cover drilling technology, reservoir physics and engineering, geological and hydrological techniques, geochemical techniques, and types of geothermal systems. The book takes a look at the world-wide status of geothermal resource utilization and the Cerro Prieto geothermal field in Mexico, including geothermal manifestations, transportation of steam, and environmental factors and waste disposal. The publication is a valuable reference for alternative energy experts and researchers interested in geothermal energy resources.